Working with Gardner Nelson + Partners and director Gerard de Thame from Supply & Demand, The Mill aided in bringing this stormy vision to life for Assured Guaranty Municipal Bond Insurance. 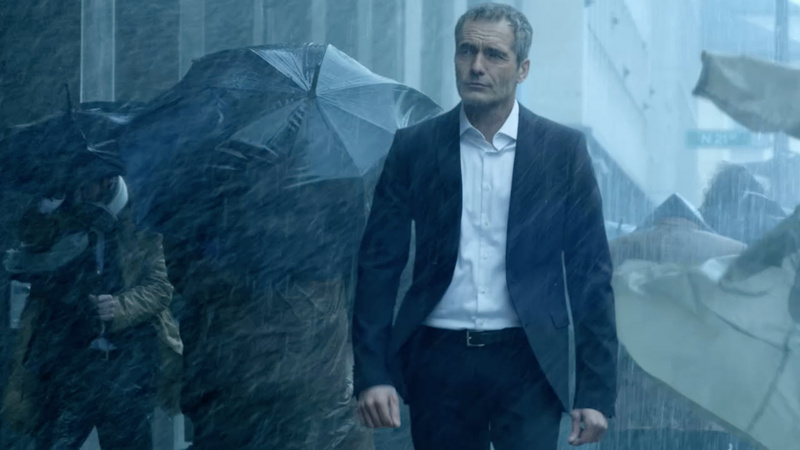 The ad shows people battling in stormy weather, a metaphor for the insecurity of the financial market, as a wise investor walks through the streets, unscathed by the beating wind and rain, confident in the knowledge that his assets are protected by Assured Guarantee. In order to achieve the perfect stormy atmosphere, highlighting the contrast between the calm protagonist and chaotic background, there were extensive on-set compositing tests with various shutter speeds and frame rates to find the perfect look for the rain. The final comps are a mix of different speed plates, with Q-Take used but an on-set editor to help visualize the final look of each comp. For the final shot the 2D team worked to comp in 80% more paper than was shot in the original plate.